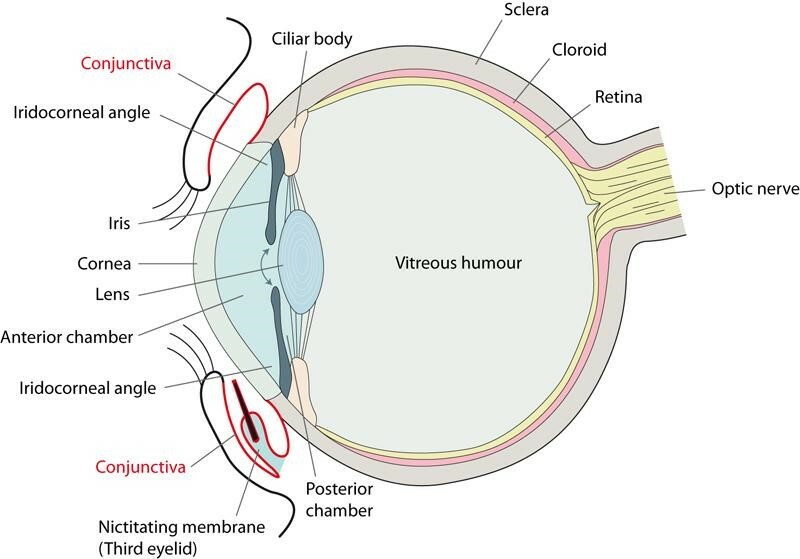 The eyelids are the first structures protecting the delicate eyeball from the outside and potentially trauma. Due to being more active, getting into fights and exploring, cats and dogs are more prone to traumatizing their eyelids. 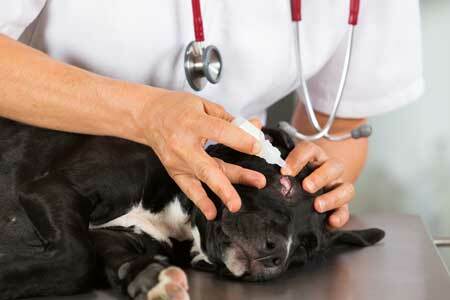 Lacerations or cuts to the eyelids are a fairly common injury seen in most veterinary practices. If there is any trauma to the eye, it is important to take your pet to the vet. Some injuries may be superficial and cleaning the wound with disinfectant may be all that is required. In other cases, the eyelid may need to be stitched back together. The sooner the eyelid is stitched, the better the chances of it staying together. It is very important that the eyelid margin (that is the part that the eyelashes attach to) remains smooth. If there is a kink in the eyelid margin, this can lead to further trauma to the eye and it can damage to the sensitive cornea. Once the eyelid has been stitched, your pet may require eye drops for a few days to assist with the healing and prevent any infection. Sometimes the third eyelid can be lacerated. This is commonly seen in cats that have been involved in a fight and have been scratched in the eye. If the third eyelid is badly traumatized, it may need to be sutured. The most common injury seen to the cornea is corneal ulceration. This is where the first outer layer of the cornea (the epithelium) is damaged, exposing the more sensitive inner stroma of the cornea. This can be very painful. A scratch to the eye or a splash of shampoo or other caustic substances can cause an ulcer. There are some viruses, such as herpes virus in cats that can also cause ulcers in the cornea. Often we do not know what has caused the ulcer. If you notice your dog or cat squinting, or the eye is closed and seems painful, then it is important to take them to the vet immediately. Often the conjunctiva will also be inflamed. This is known as conjunctivitis. The eye may also have some discharge. The vet will examine the eye with an ophthalmoscope. This will allow the inside of the eye to be seen and ensure that there is nothing else going on. The vet will then perform a fluorescein test. This is where an orange stain is placed on the cornea. The eye is then looked at with a UV light (blue coloured light). If there is any defect in the cornea, this will show up as bright green. The corneal epithelium does not take up any stain but if the stroma is exposed it will take up the stain. Corneal ulcers can vary in size and severity. It is important to start treatment as soon as possible as the quicker it is treated, the more likely it is to heal. If the injury is superficial and small topical treatment with eye drops remains the most effective treatment. It is important that eye drops containing corticosteroids are not used as this delays the healing of the cornea and can, in fact, make the ulcer worse. Other drops and medications may be needed for pain control or to maintain the eye’s lubrication. The eye will need to be assessed daily to ensure that it is healing. In some cases, further treatment will be needed. In severe cases, the ulcer may need to be covered with either the third eyelid or some conjunctiva. This procedure will need to be done under general anaesthetic. The flap is placed over the cornea and sutured in place to give the cornea time to heal. The vet may even give you a referral to a specialist veterinary ophthalmologist which is a vet who would have done between four and six years of extra study over and above their veterinary degree, to become an eye specialist. There is no set time to how long the cornea will take to heal but daily checkups are required initially to ensure that the condition is not deteriorating. In very severe or long-standing cases, the eye may even need to be removed. 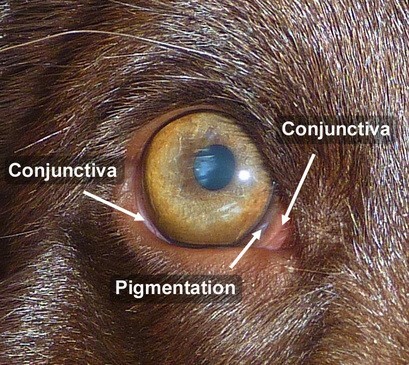 Penetration of the cornea by foreign bodies such as thorns, glass and sand can be seen in dogs and cats. This is normally very painful and can quickly lead to infection within the eye. If the foreign body is just penetrating the surface of the cornea, it may be removed with the aid of local anaesthetic. In severe cases, where the foreign body has penetrated deeper into the cornea and eye, it will need to be surgically removed. Fine instruments are often required in order not to damage the eye further and this procedure may need to be performed by a specialist ophthalmologist. If your pet is showing any signs of pain or discharge to their eye, it is important to seek immediate veterinary attention. What is the prognosis with eyelid and corneal trauma? The prognosis of injuries to the eyelids and cornea will depend on the severity of the trauma. If treated quickly, then permanent damage to the eye is minimized but this does depend on how extensive the injury is. The cornea scars white and so if the ulcer is very deep or long-standing this can affect the eyesight, particularly if the scar forms over the part of the cornea that is in front of the pupil. It is important to remember that the quicker it is treated, the more successful the treatment is likely to be. If you notice any pain, discharge or redness to your pet’s eye, it is important to take them to vet for an assessment. You may ask how do you determine that your pet experiences pain in their eyes? Apart from you visibly seeing damage to the eye or noticing an eye which is excessively teary, you will most likely notice your pet scratching at the injures eye with their front paw or alternative scratching the eye or face on furniture or the carpet, in an effort to relieve the discomfort and pain. If you are in doubt, err on the conservative side and get your pet to the vet as soon as you can. The loss of eyesight through the loss of an eye is simply not worth risking seeing whether the animal will get better by themselves.